Yay, today I can talk about books! As far as literature is concerned, Spain isn't given enough credit. It has an impressive history of short stories, plays, and poetry, and though it may not have many world-renowned novels, it's the birthplace of the modern novel. That's right. 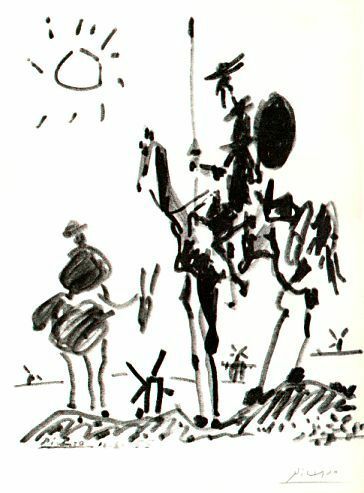 Don Quixote, by Miguel de Cervantes, published in 1605, is often considered the first novel as we know novels today. (That is, not written in verse). Don Quixote follows the adventures of Alonso Quijano, a gentleman who gets caught up reading stories about knights, believing them to be true, rather than works of fiction. So he decides to become a knight himself, renaming himself Don Quixote de la Mancha. Essentially, he has a habit of turning reality into fantasy: an inn becomes a castle, and most famously, a windmill becomes a giant, which he attempts to slay. Eventually, after "defeat" by another "knight," (actually someone trying to get him to stop this nonsense), he returns home and regains his sanity. Wonderful Cervantes museum in Guanajuato, Mexico.